Our pick of the best architecture and design opportunities on Dezeen Jobs this week include a position with Ennead Architects in Shanghai and a role with Carlo Ratti Associati in Turin. American firm Ennead Architects is offering an architectural internship at its office in Shanghai. 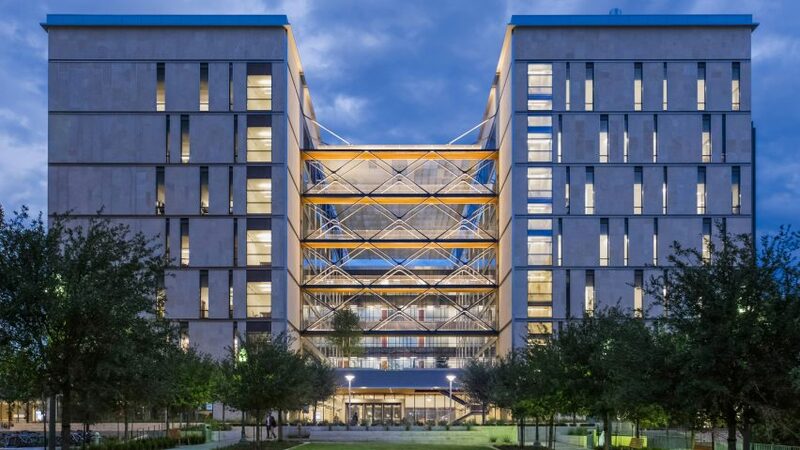 The firm recently completed a new building for the school of engineering at the University of Texas in Austin. Carlo Ratti's studio recently announced it is working with BIG on a 280-metre-high skyscraper with trees bursting through the facade in Singapore. The Turin-based office is currently looking to recruit a project manager. Canadian studio ACDF Architecture is looking for architects at all levels to join its practice in Montreal. The firm recently completed a wood-clad home overlooking Lake Memphremagog, featuring a triangular roof and floor-to-ceiling sliding glass walls. London Design Festival venue designjunction is looking for a digital marketing assistant to support its marketing team. For last year's edition, it commissioned designer Adam Nathaniel Furman to create a sequence of tiled gateways in Granary Square. AECOM is looking for an interior-design practice lead to oversee projects across several regions. The firm's recent projects include masterplanning the Olympic Park for the games in Rio de Janeiro in 2016.